With a brand new year underway, I am sure you and your team have a lot of tasks to handle, and probably some new habits to work on as you stick to your resolutions. However, as you start on this New Year in all its glory, keep in mind one critical element you’re carrying over from last year: your sales pipeline. When it comes to salespersons, it is not just their physical health that needs to be at its finest; their sales pipeline needs to be fit as a fiddle too. As your sales team constantly fills pipelines with deals, they should be constantly checking the pulse of those deals in order to ensure that they achieve the healthiest results. So, what exactly are the signs that indicate a healthy sales pipeline? • It has prospects at each stage: Though it sounds obvious but focusing entirely on closing deals at the latter stage without actually filling the pipeline at the beginning, you’ll be left stranded in the desert once those deals are closed. • It keeps moving: A pipeline needs to flow constantly. If a deal stays for too long at one stage, chances are, that it won’t close. Take a good look at the deal and sort it out in case it sticks for longer than you expect. • Updated and accessible: A good sales pipeline should be visible and open to people in the sales process. It can help teams leverage other people’s connections and maybe even indulge in healthy competition. Also, if you fail to keep it up to date and review it regularly then it is of no use. Empty Sales Pipeline VS Mismanaged Sales Pipeline. An empty sales pipeline as the name suggests is one without any prospects. When managers pass down instructions to update pipeline, rarely do executives take it seriously. Although emptying your sales pipeline might seem counter-intuitive, but it is imperative for most sales executives. When people talk about “an empty pipeline,” they don’t necessarily mean having no prospects at all but instead about being choosy about whom you keep in the funnel when it is time to clean house. The idea of “bigger is better” isn’t always true in the case of sales pipelines. For instance, if your goal is to have at least 15 deals in your pipeline at any certain point of time, and you have 40, this seems like a better situation, doesn’t it? Having so many deals in hand you probably think you are at your A-game. No matter how pleasing it sounds in your head, it may not always be the case. Too many deals spread across your board don’t give much room to explore resources optimally. As you are unable to give proper attention to all the leads, some grow cold. Once you stress over the fear of an empty pipeline, you are prone to let it get overstuffed with prospects. This will give birth to what you should actually fear: mismanaged pipelines. An interesting thing is that effective lead management is directly proportional to the revenue growth. A research conducted by Vantage Point Performance and the Sales Management Association revealed that 44% of executives in B2B companies think their organization is ineffective at managing their sales pipeline. In another survey by Harvard, companies that reported ineffective pipeline management had an average growth of 4.6% while those with effective pipeline management saw 28% higher revenue growth. Hence, the enemy here is sales pipeline mismanagement. You may have multiple executives working on the same opportunity independently without having any idea. This will distribute your resources at unruly tasks while minimizing sales potential. Since, you have no key insight into your actual sales potential, you won’t be able to manage your budget, operations or sales activity etc. In addition to this, the targets set will seem too high to reach ultimately jeopardizing operations and your brand’s reputation. We’ve all been in a situation where, we had to transfer money to another country. One thought about this rings a bell about the nuances that it comes with – be it the huge commission, the fluctuating forex rates or bank hassles. Now let’s assume a platform which allows sending money without all the trouble that’s mentioned above. Wouldn’t that be great?? Well, look no further… Transferwise, the tech pioneer is actually doing this! The claim is that one can send money at real market rates for a small fee. Hearing this, I decided to give it a try the next I make a cross border transaction and to my surprise their claim was indeed true. I could send money at a mid market rate with a fee that didn’t cost you a fortune when compared to sending money with a traditional bank or firms like Western Union & Moneygram. How do they do this is what makes them very innovative & a true pioneer by all means. Unlike traditional banks, there’s no currency conversion happening here. 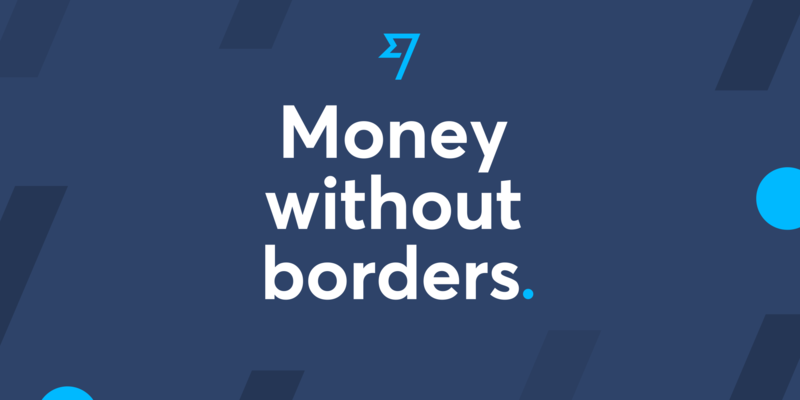 Transferwise uses two local currency accounts – one to receive money from the sender and the other to transfer the equivalent amount to the beneficiary. 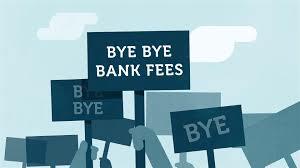 By doing this, they do not lose money due to currency conversion thereby providing an opportunity to levy a tiny fee. Though the offer was good, there was a catch! 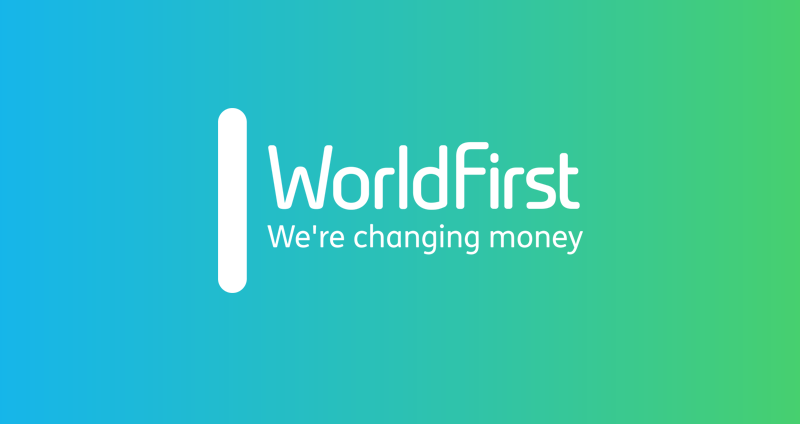 Only users with internet and bank accounts can use Transferwise as the company doesn’t have any offices/physical locations like banks and other money transfer service providers. But Transferwise has figured a way to tackle this. They have started issuing borderless accounts with a debit card to keep. All this growth doesn’t come easy. Transferwise managed to stay relevant in the market by continuously innovating and re-thinking. They heard what their customers told and worked on them and this is a testimony to the position in the market that they hold today. Do not put all your eggs in one basket – Warren buffet’s advice on investment. Wealthy individuals often follow this principle and typically hold their assets in limited partnerships, family trusts or in alternative and illiquid investments spread across a number of banks and accounts. Studies show that more than 76% of the wealth management experts find it difficult to aggregate, report, bill, manage the portfolios which deals with multi currency, partnership accounting etc. 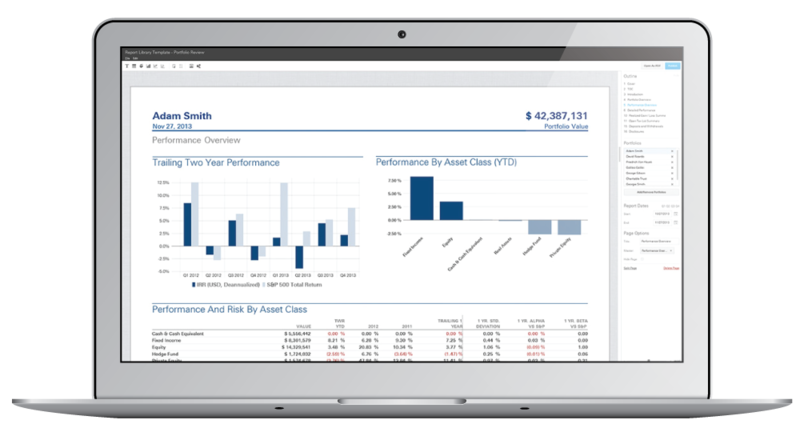 Currently, the private wealth managers use different softwares to run all of their reporting and hold all their data in one place and do all client access and client notes, like managing multicurrency or partnerships. The only inevitable thing in this universe is change and the same has struck the field of wealth management by the name Addepar. Addepar’s software is aimed at wealth managers who have to keep track of billions of dollars in assets, from real estate and artwork to stocks and investments in venture capital funds. Many companies rely on Excel spreadsheets to do this type of work, while others use old software that can’t combine different types of assets in a single view. 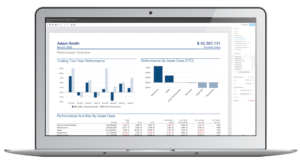 Addepar has developed ways to organize assets into a consistent format and displays the information with the gloss of a consumer Web app. Addepar handles all types of assets in any currency, so investors and advisors have a clearer financial picture at every level, all in one place. Addepar places all those previously used softwares within one single platform. Addepar’s platform will allow the Wealth Managers to gather information from those various accounts in one place, and to quickly parse the data to answer individualized questions. Addepar have started to work with the banks in order to enhance the efficiency of the banks.Before, the banks used to have better technology and that was a big advantage of theirs, now the other Private Wealth managers who have this new technology,Addepar, are getting ahead and hence the banks started using Addepar. Addepar is also going one step ahead by helping the entities to access all those different types of products and services and teach their clients what is best for them using the platform.,Addepar, thus, helps to increase the efficiency of the wealth managers by saving time and reducing the erroneous assumptions or data.Like any other company, it is also not free from competitors.Some of the competitors of Addepar are GlobalSCAPE, DigitalTown, Mimecast, Introhive etc. Just Walk Out – The amazon way!! Imagine yourself walking to a store, picking up something and proceeding to pay! This instantly clicks your mind that the payment is attended by a cashier. You’re going to meet some who’s gonna take money from you in return for the product you’ve bought. This is a feeling that we’ve all become accustomed to. Now, Amazon is trying to change this with their new offering called Amazon GO! The company opened their store to public on public on January 22nd. Amazon Go was officially opened on December 5th in 2016, but this was only available for Amazon employees. Amazon Go sells mainly grocery items, but unlike any other store, Amazon Go is cashier-less. Using technology similar to that found in self-driving cars, such as computer vision and machine learning algorithms, people are able to take whatever items they want, and sensors detect which items have been taken, and by who. People who do shop at Amazon Go have to install the app on their phones, which adds items to the consumer’s online cart. 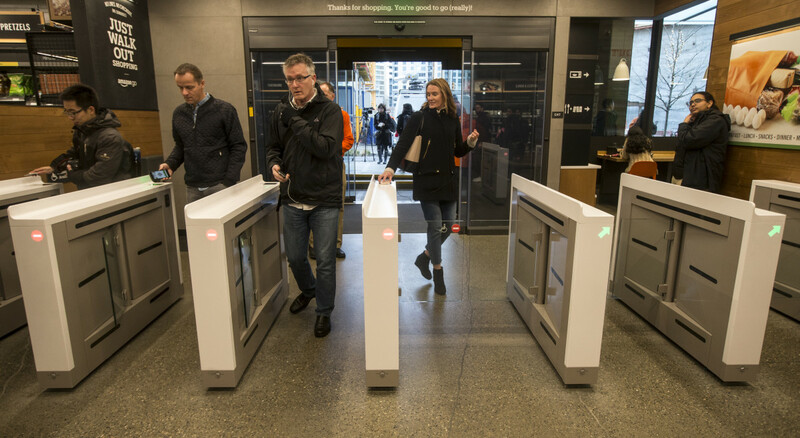 You are allowed to enter the store only if you have the Amazon Go application on your phone, as there are small gates at the entrance where you are able to scan your phone with the app open, which opens the gate for you. Cameras are placed throughout the stores, and weight sensors on the shelves are able to detect when items have been taken. When you leave the store, a few minutes later, the items you took will be added to your Amazon account. Although this is a cashier-less store, there are still workers in the store, such as employees in sections with alcoholic beverages to check IDs before a customer is able to take any beverage. Additionally, there are workers there to assist customers. Though the above sounds cool, recent reports state that customer complaints have risen due to irregularities with payment. Some customers claim to have been charged more while others don’t get charged at all. Even though Amazon claims this does not happen often, people could have a chance of taking something expensive and not getting charged. One of the reasons why Amazon Go has built up much interest is because it is extremely convenient for customers because it removes the whole process of checking out items. Amazon plans to slowly implement more Amazon Go stores throughout America in the next few years. Does all of what written above make you think that Amazon is targeting a monopoly in the retail space??? It’s a truth only time will tell!! AR – Technology at its best! Over the past couple of years we’ve all been going gung ho about VR. It opened up a lot of possibilities and entertainment to people. But amidst all of this noise and talk, there was something similar that was preparing itself for the big launch. Augmented Reality or commonly called as AR, it is!! Augmented Reality turns the environment around you into a digital interface by placing virtual objects in the real world, in real-time. Augmented Reality can be seen through a wide variety of experiences. Let’s imagine you’re a fighter pilot flying over a warzone with anti-aircraft fire shooting up at you. You really have to concentrate and looking down at all the gauges on your instrument panel is a distraction you can do without. Fortunately, you’re wearing what’s called a heads-up display (HUD), a set of goggles with built-in, miniaturized computers that automatically project instrument readings so they “float” in front of your eyes. You can find out everything you need to know without taking your eyes off the sky. The first AR technology was developed in 1968 at Harvard when computer scientist Ivan Sutherland (named the “father of computer graphics”) created an AR head-mounted display system. In the following decades, lab universities, companies, and national agencies further advanced AR for wearables and digital displays. These early systems superimposed virtual information on the physical environment (e.g., overlaying a terrain with geolocal information), and allowed simulations that were used for aviation, military and industrial purposes. You’re out and about in the real world with your laptop, netbook, or cellphone, it’s easy enough to get information: just bring up Google and type in some words. In the brave new world of augmented reality, it’s even easier: you get the extra information automatically. That means your portable computing device needs some automatic way of finding out where you are or what you’re looking at—a problem known as tracking. Where have we seen it being used? The first commercial AR application appeared in 2008. It was developed for advertising purposes by German agencies in Munich. They designed a printed magazine ad of a model BMW Mini, which, when held in front of a computer’s camera, also appeared on the screen. Because the virtual model was connected to markers on the physical ad, a user was able to control the car on the screen and move it around to view different angles, simply by manipulating the piece of paper. The application was one of the first marketing campaigns that allowed interaction with a digital model in real time. Other brands started adopting this idea of situating content on a screen and having consumers interact with it through physical tracking markers. We start seeing more advanced versions by brands such as National Geographic in 2011, which showed rare or extinct animal species as if they were walking through a shopping mall; Coca-Cola in 2013, which also simulated environmental problems, such as ice melting right beside you in a shopping mall; and Disney in 2011, which showed cartoon characters on a large screen in Times Square interacting with people on the street. In each of these examples, the AR technology was used to engage customers at events or in public spaces. These types of displays aren’t always scalable, as they require considerable investment—but we still see them today. For instance, Skoda ran a campaign in 2015, placing an AR mirror in a Victoria railway station in London, so that people passing by could customize a car and then see themselves driving it on a large screen. Don’t worry. You don’t have to understand the technical nuances behind the screen to use Bitcoin. What you need to know is that Bitcoin is the currency of the Internet. It’s similar to paper money, like the Swiss franc, the euro or the US dollar. That is, it has no hard, inner worth, only the worth assigned to it by the issuer. 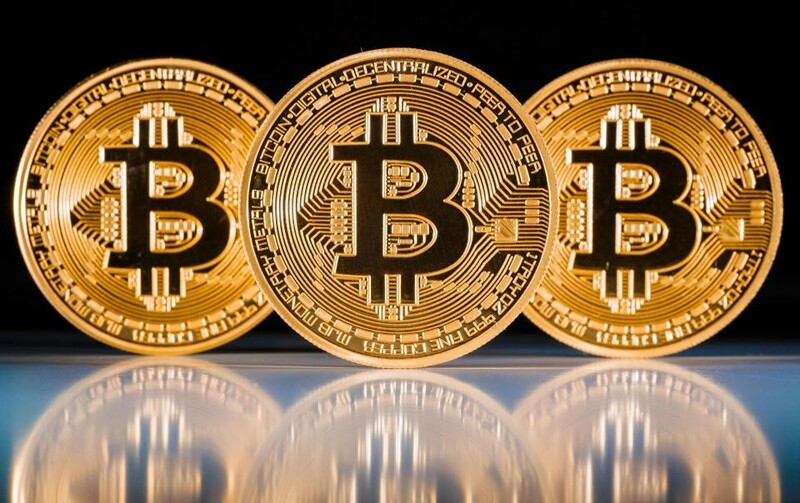 Unlike national currencies, however, Bitcoin is issued by private entities. For the franc and co., the respective country’s national bank stands behind the currency. This is not the case with Bitcoin. And another big difference between conventional currencies and Bitcoin: you can’t hold a Bitcoin in your hand. It’s purely digital, not physical. In the meantime, you can acquire Bitcoin at selected cash machines (ATMs) in many cities. In Zurich there’s one at the Café Schoffel in the Niederdorf neighborhood. Otherwise, you buy Bitcoin offline for cash or on an online exchange. For offline purchases, look for a trustworthy dealer on localbitcoins.com. To find a good selection of online exchanges, take a look at bitcoincharts.com. And, of course, you can sell your products or services for Bitcoin in order to acquire the currency. Or, you can generate Bitcoin yourself. Ok, I have one – But where do I store/save? They may be virtual but you still need a wallet for your Bitcoins and your wallet has to have two “sides” a public side for receiving Bitcoin payments and a private one for you to store or move your Bitcoin.For your Bitcoin wallet one option is to install a software package on you computer. Either multibit.org or electrum.org might be a good place to start. You can also create an online Web wallet and for beginners, blockchain.info is a good address. It offers a sensible compromise between security and user-friendliness. They also offer a trial wallet without having to register, so you can decide if the service suits you or not. In the meantime, not only online shops and services accept Bitcoin. Bricks-and-mortar shops and even hotels are taking payment in the currency. At present in Switzerland, some seventy business accept payment in Bitcoin. A good overview of this growing list can be found at coinmap.org. Of course, it’s easier to spend Bitcoin online. 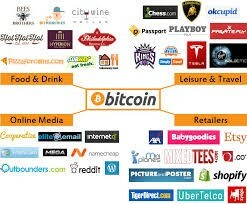 At the moment, bitcoinstore.com is the flagship of the Bitcoin retail movement, trying to establish the currency’s functionality. Prices are often lower than Amazon’s although high shipping costs erase much of that advantage, at least to Switzerland. You can cash in your Bitcoin holdings in exchange for precious metals at coinabul.com. And the currency is also accepted at the money museum in Zurich, the first and perhaps still the only museum in Europe to honor Bitcoin. How much is it worth for? It’s in the news, a part of every conversation we have. The markets are going crazy over it, prices are soaring high seeing growth ten folds. Bitcoins, Litecoin etc are just types of this. So, what is that we’re talking about? Cryptocurrency it is!! 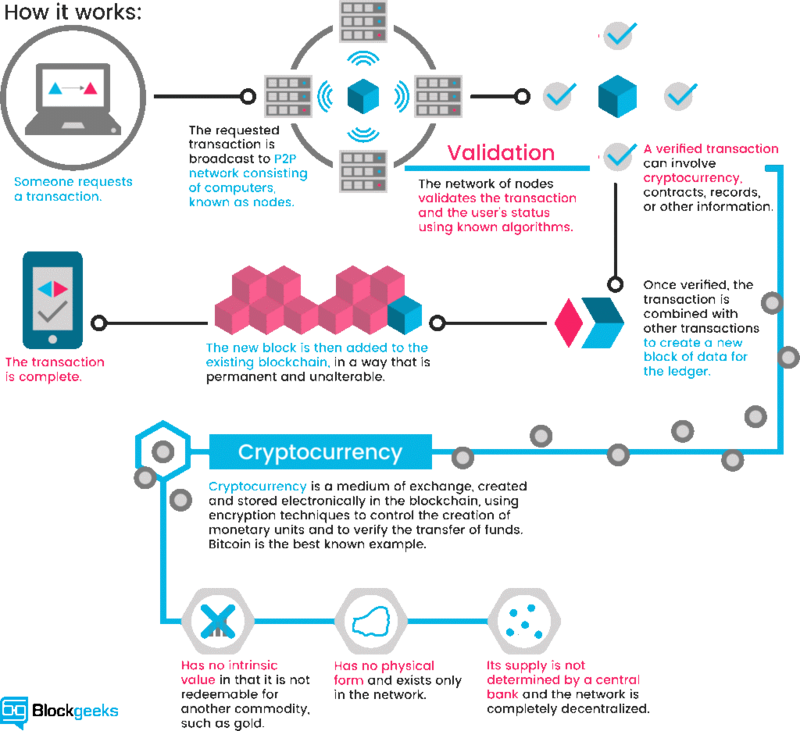 Let’s delve a little deep into understanding what a cryptocurrency is. 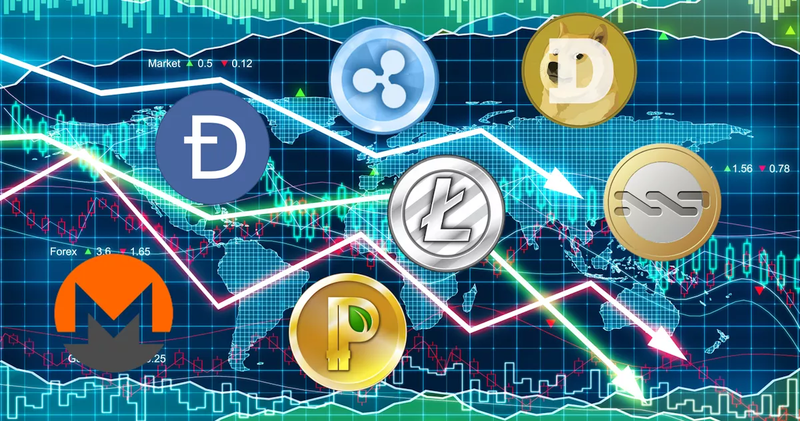 Cryptocurrencies, sometimes called virtual currencies, digital money/cash, or tokens, are not really like U.S. dollars or British pounds. They live online and are not backed by a government. They’re backed by their respective networks. Technically speaking, cryptocurrencies are restricted entries in a database. Specific conditions must be met to change these entries. Created with cryptography(codes), the entries are secured with math, not people. Restricted entries are published into a database, but it’s a special type of database that is shared by a peer-to-peer network. For example, when you send some Bitcoin to your friend, you’re creating and sending a restricted entry into the Bitcoin network. The network makes sure that you don’t have the same entry twice; it does this with no central server or authority. Following the same example, the network is making sure that you didn’t try to send your friend and your another friend the same Bitcoin. Cześć Poland…. Says Android Pay!! More and more, people are paying for items in the real world using their smartphones, thanks to the introduction of mobile payment services. 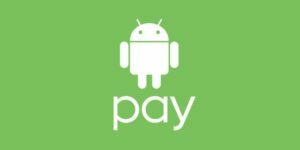 One option is Android Pay, developed by Google to be used on both Android smartphones and Android Wear-based smartwatches. In this article, we will give you all the information you need about Android Pay, including its history, how and where to use it, and most importantly what banks currently support it. 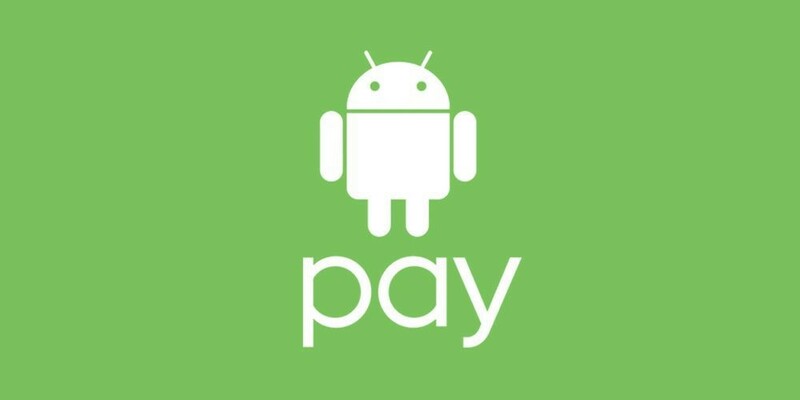 Android Pay was first announced by Google at its 2015 I/O developer conference, and it officially launched a few months later on Sept. 11, 2015 in the U.S. Android Pay is a successor, kind of, to the older Google Wallet, which is still around but is now used by people to send money to others. Android Pay, on the other hand, is a full mobile payment system, designed to let people purchase items and services both online and in the real world. While it launched first in the U.S., Android Pay has since expanded its reach and is now available from banks and other financial institutions in the UK, Canada, Ireland, Poland, Singapore, Australia, Hong Kong, Taiwan, Belgium, Japan, Russia and New Zealand. Google launched a separate payment service, Google Tez, in the huge market of India. It works with the Indian government’s Unified Payments Interface (UPI) for mobile transactions. Using Google/Android Pay is simple. Just wake up your phone (you don’t even have to open an app or unlock it), hold it to the payment terminal, and voilà! Your payment is done. After you check out, you’ll get helpful information on your phone about your recent transactions. Where and how can I use it? Android Pay in Poland is supported by Alior Bank, Bank Zachodni WBK, mBank and T-Mobile Banking Services. In terms of retailers, Android Pay in Poland is supported at pretty much any location that has the required NFC terminal hardware, which is available at more than 400,000 locations in the country. Living in real time – A view from Marketing!! Real-Time Marketing has been all the rage since the lights went out in the Superdome during the third quarter of Super Bowl XLVII. We’re all aware of Oreo’s quick response to the blackout. It was their agency 360i, who, armed with a social media war room and lots of dollars, managed to capitalize on a captive audience who could not take their eyes off of a dimly lit Superdome. 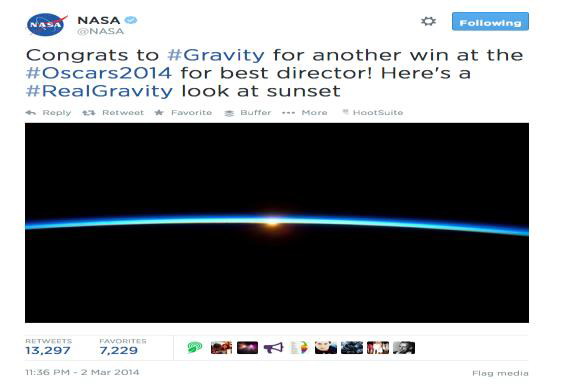 It was perfect, the message heard ’round the world – Power out? No problem – YOU CAN STILL DUNK IN THE DARK. So what happened after the tweet heard ’round the world? 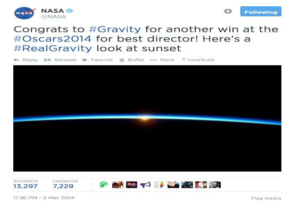 Lots of brands assembled specialized social media teams, built war rooms and challenged their agencies to bring them an opportunity to cash in on the real-time marketing phenomenon. There is no telling how many monitors were hung from walls in impressive formations, all intent on catching the big moment. This paved way for the phenomeonon that is called as ‘Real Time Marketing’. What do geeks Think of it? The definition of Real Time Marketing published by Paul Jasper in Digital Marketing Magazinge states that ‘Real-time marketing (RTM) is the ability for brands to engage with their customers based on real-time information, such as their behaviour and actions on a website, changes to their data, or even external news and breaking events. 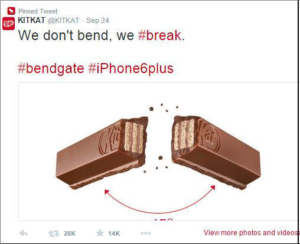 The latter is most notably seen on social media platforms such as Twitter, with brands like Oreo in particular enhancing its online persona through real-time marketing activities. This strategy sees brands not only focusing on a fixed marketing strategy that adheres to a strict schedule, but a strategy that is more flexible, focused on breaking news, relevant trends and immediate customer feedback. What does it mean to you & I? Real time marketing, in a nutshell, is marketing in response to events that have just occurred. It involves taking advantage of the present, and living in the here and now, and incorporating all of that into a marketing strategy. 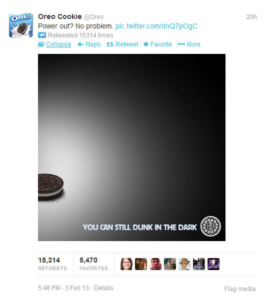 The Oreo tweet is a prime example of how a brand tapped into a real-time event and sent out a branded message that resonated with audiences. The timing couldn’t have been better; millions of people watch the Super Bowl, giving Oreo a chance to put out a message with enormous reach. Real time marketing is best used in conjunction with social media because of social media’s power of interacting with the masses in real time, right now, as it’s happening (live!). You can quickly respond to an event with a clever remark or a witticism, slap together an eye-catching photo, and voila – get attention for it. This works because we as a society are all about the here and now. We’re all about the latest craze, or the Big Event, or what celebrities are doing, or what’s going on in the world around us in this moment. And whenever a brand can use that energy and capitalize on it with a branded message, magic happens. Some Examples – Only For U! In the wake of recent years, marketing has turned out to be the most pivotal aspects to be mastered by pretty much anyone trying to build, maintain and increase his/her personal brand. Expertise, along with quality content & products and/or services, has been key in shaping impactful businesses since the dawn of time. 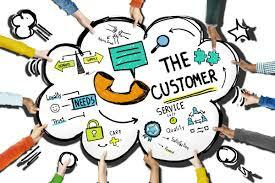 However, alongside those factors, customer satisfaction has become the X factor that now separates successful businesses from unsuccessful ones. Those who can and know how to engage with and keep their customers happy are those who thrive, rather survive in today’s ‘dog eat dog’ environment. One of the main reasons for this customer-centred strategy shift is the upper-hand that the latter, now has more than one option to voice out their opinion/feedback which the world can get to know, all with a swipe. In this new digitally developed world, customers can leave their thoughts and opinions on basically every matter, freely and without reservation. Given this, it is essential for every company to have an effective customer relationship management strategy in place; one that deals with all aspects of acquiring, engaging, and growing customers. “Customer first” is no longer just a slogan; companies must place their clients at the centre of their attention, and let them know that their opinion matters more than anything else. They should be given the opportunity to directly interact with brands, to talk about them, to propose new ideas, and, eventually, to share their brand-related experiences and passions with the world: that is how a brand can eventually achieve so-called ‘exponential growth’. That is how corporate giants like Amazon, Nike, Apple, and JetBlue came to prominence in a very short amount of time, and that is how they have prospered even through hardships and difficult times, such as the great 2008 recession. They have learned how to sell and how to properly present themselves to their customers and, in doing so, they have been able to increase their value proposition without cutting the prices charged. The current age has a new standard, one that sets the bar much higher: create and maintain active relationships with customers, engage with them, and eventually turn them into brand ambassadors.